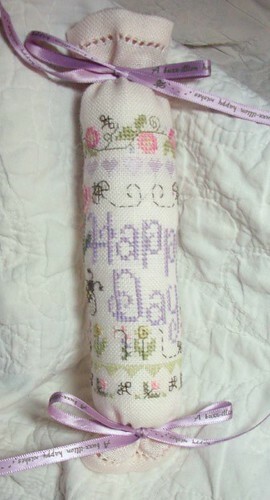 Nicole's Needlework: Needle Roll Finish! I was going to finish up my other pillows while I was at it, but I ran out of fiberfil. So I figured I'd used my 50% off coupon at Jo-ann's and get one of those quilter's kits that have the rotary cutter, ruler and board and get some more fiberfil while I'm there. I'd like to get them finished tomorrow if I get a chance. Maybe I'll head out to Jo-Ann's in the morning. :) Tonight I'm going to watch more Grey's Anatomy and try to get that sampler closer to being finished! I love your needleroll Nicole, that design is so cute it makes me smile. I love your needleroll. It's very pretty and delicate. I love delicate things. Thanks so much for your emails, I really appreciate them. What a lovely needleroll. I really like the ribbon. Your needleroll looks great - congrats on the finish! I need to figure out how to do the hemstitching - I'm going to tackle that soon! So pretty - I love it.